The mayors of four municipalities involved in the Ontario Basic Income Pilot Program issued a joint letter today (September 5) asking the federal government to assume responsibility for the cancelled provincial project. The letter was sent to the Honourable Jean-Yves Duclos, Minister of Families, Children and Social Development, by Hamilton Mayor Fred Eisenberger, Brantford Mayor Chris Friel, City of Kawartha Lakes Mayor Andy Letham, and Thunder Bay Mayor Keith Hobbs. “We’ve come together to share with Minister Duclos that there is broad-based support for the continuation of this important evidence-based program,” Hamilton Mayor Eisenberger says. Launched under the previous Liberal provincial government, Ontario’s $150-million basic income pilot is the first and largest basic income trial in North America. Almost 4,000 people were enrolled in the pilot program in five regions: Lindsay, Thunder Bay, Hamilton, Brantford, and Brant County. During the pilot program, single participants receive up to $16,989 per year while couples receive up to $24,027 per year, less 50 per cent of any earned income. The pilot project gained global attention for its potential to provide the evidence to eliminate income assistance systems that are often inefficient and stigmatizing. Despite promising to continue the program during the spring election campaign, on July 31, 2018, Lisa MacLeod, Ontario’s Children, Community and Social Services Minister, announced the three-year project would be cancelled after only one year. The announcement was made as part of the Ford government’s plan to “reform social assistance to help more people get back on track.” In response to criticism of the decision, the Province then claimed the program is not cost effective but has provided no evidence to support the claim. Since then, the Ontario government has advised that participants in the program will receive their final payment on March 31, 2019. On August 27th, four Lindsay residents represented by Lindsay lawyer and social advocate Mike Perry filed a proposed class-action lawsuit against the Government of Ontario for cancelling the Ontario Basic Income Pilot, alleging breach of contract and negligence. Hamilton photographer Jessie Golem has launched a photographic series called “Humans of Basic Income”, showing the human side of the decision to cancel the basic income pilot project. Herself a participant in the program, Golem’s portraits of participants in the program — who are holding signs sharing their stories of how project has benefitted them — has received attention from national media. Golem is seeking pilot project participants in Lindsay who would like to be photographed as part of her series. She is hosting an event in Victoria Park and downtown Lindsay all day on Sunday, September 9th and Monday, September 10th. 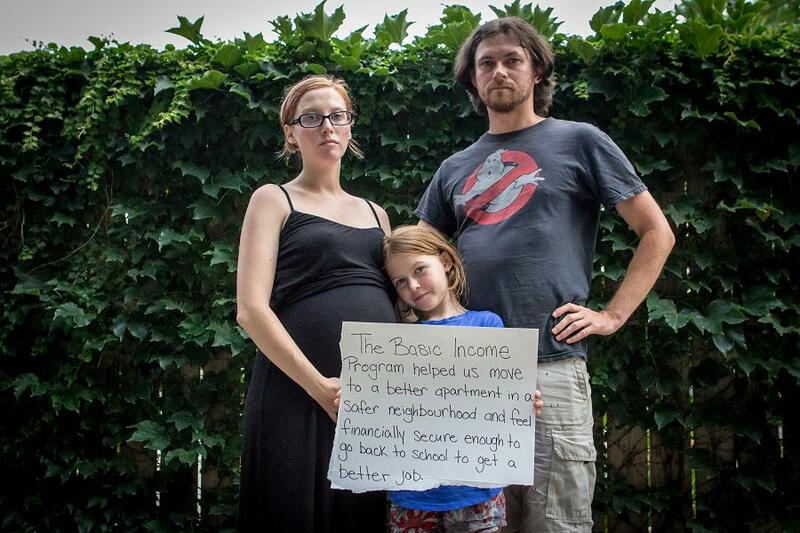 For more information about Humans of Basic Income, visit bringbackbasicincome.ca.